HYDAC has developed a revolutionary system that monitors the integrity of the bladder of a bladder accumulator. 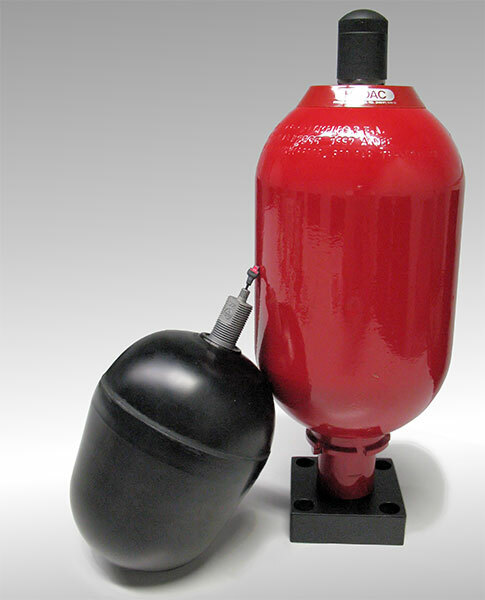 Hydropneumatic accumulators are pressure vessels designed and built to store fluids under pressure. They are charged with nitrogen which is separated from the fluid section by a piston, bladder or diaphragm. HYDAC has over 50 years of experience in the research, development, design and production of the accumulators. The principle applications of accumulators are energy storage, emergency and safety functions, damping and the reduction of vibrations, pulsation damping, shock absorption, suction flow stabilisation, media separation, energy recovery, volume and leakage compensation and also weight equalization. Using an accumulator improves the performance of the whole hydraulic system, and can give great safety and comfort for operators of machines. It is important to know that hydraulic accumulators present an acute safety risk to personnel and equipment if not correctly engineered, applied or maintained. Particularly in a bladder accumulator, the bladder, a crucial component between the gas and the fluid, can be deformed and the effects of temperature and aggressive media on the elastomer material can destroy the bladder. To date, there have been no means of directly monitoring the bladder integrity in individual accumulators, particularly in accumulator stations where testing is very time-consuming and costly. HYDAC has just introduced a new product able to inform you if there is a problem in the bladder, the product is called BIS, which stands for Bladder Integrity System and it consists of BIS bladder, BIS adapter and electronic components BIS 1000. The BIS detects fluid which has penetrated the bladder and transmits a signal. A split is therefore detected in the bladder. In addition, the temperature and pressure can be monitored electronically (current loop/HART). The BIS is available together with a bladder accumulator as initial equipment. A retrofit version is also available, both for HYDAC bladder accumulators and for other brands as well. There are different types of the BIS that can be chosen to fit your needs, the types are: basic, ATEXia [ATEX (94/9/EC), IECEx], ATEXd [ATEX (94/9/EC), IECEX, cCSAus] and ATEXd+ which comes with a junction box in aluminium or stainless steel. There are many advantages of using HYDAC Bladder Integrity System. By identifying a defective bladder during operation; you can have a planned repair / maintenance interval and reduction in downtime. Also, you can monitor the pressure and temperature of an accumulator during operation. You can find more information at www.hydac.com.au.